Every year about this time, we’re preparing to travel to Greece and catching up on the latest Greek news when we read about the just-completed magic that is Oinorama, and it makes us wish we’d booked our flight for just a few weeks earlier so we could have caught it. Well, this year we finally did. 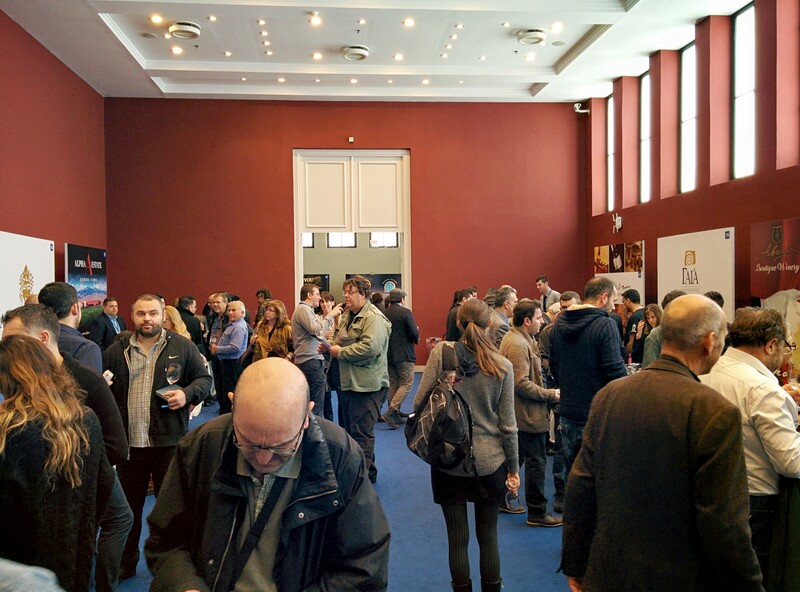 Oinorama is a 3-day wine tasting that features, as near as I can tell, every Greek vintner — something like 170 wine-makers pouring samples of virtually their entire production. Saturday and Sunday are open to the public, Monday is trade-only. We went on Saturday, and it was glorious. We visited the stands of all of our favorite wine makers, had a chance to see and talk with some of them, and sampled some of the products of vintners that had been recommended by friends or wine writers, We confirmed our opinions of our favorites, discovered some exciting new offerings by wineries we know well, and found a couple of wineries we’ll have to investigate further. Great fun, and it gave us new respect for people who do this sort of thing for a living. The owner of the local wine shop told us he samples at least 70 wines at Oinorama, and the wine staff at Zatinya said they sampled 85 wines a day, three days in a row when touring Greek wine regions. We tasted, I would guess, 36-40 different wines in a couple of hours, and our palates were dead when we left. But what a way to kill one’s palate! Oinorama is held at the Zappeion, a conference and exhibition center in the Public Gardens near the Parliament building and the Panathenaic Stadium. In was built in 1888 by generous Greek citizens Evangelos and Konstantinos Zappas, and was used as the fencing hall during the first modern Olympics in 1896, as well as the press center during the 2004 Olympiad. 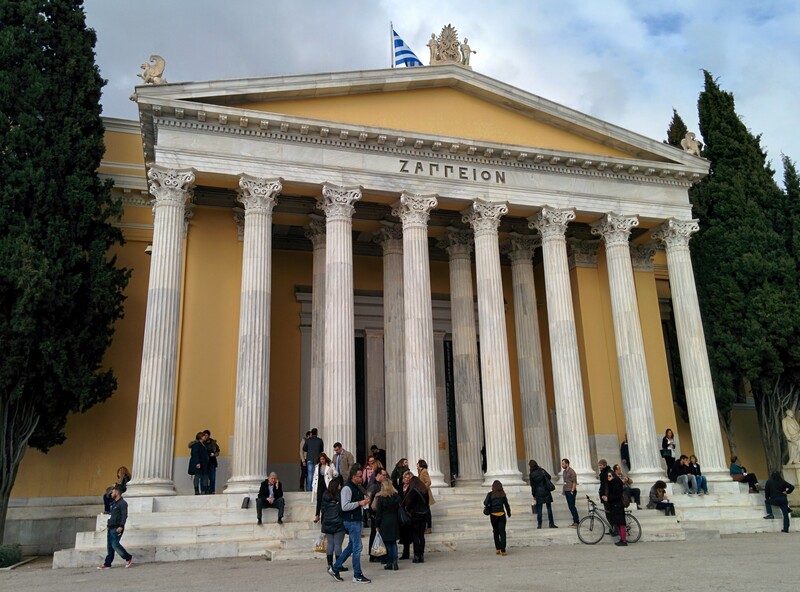 We’d visited the Zappeion as a Athens site — the entrance hall and atrium are gorgeous, and a tremendous improvement over any other exhibition hall I’ve seen — but never imagined we’d attend an event there. The exhibit space is a chain of connected rooms arranged in a semi-circle around the huge circular atrium. This phone photo was taken in one of the rooms. The keen-eyed will notice the G’aia stand on the right, and the Ktima Alpha stand across the aisle. Those are two of our absolute favorites…we spent a lot of time in that room. That sounds like a great excursion. I believe that not only my palate would have been wiped out, but my ability to stand upright would have been, as well. I am glad to see the groundwork commencing for our next visit to Hellas. Did you happen to find out if any of your favorites are exported to the States? We did a lot of spitting, sadly, and emerged with only a buzz. We asked everywhere about exports and got the same answer we’ve been getting for 8 years, “Yes, to New York.” Worse, when we asked where to get these wines in Korinthia, we were consistently told they are available in Athens. The distribution system is broken at some point, and it seems no one knows how to fix it. Thanks for the kind words, and thanks for telling me about the bookfair. Any chance to shop English-language books is appreciated, and a return to that wonderful venue would make it that much better.